Pioneer N-30AE review | What Hi-Fi? There’s a yawning gap in the market at the moment for a good-sounding music streamer at around the £300 mark. Our go-to streamer at anywhere near this price is Arcam’s mighty rPlay, currently selling once again for around £400 (after having been on sale briefly for a tantalising £330). But for now, anything priced at less than £400 has been found somewhat wanting in sound quality terms. The specification and features of the Pioneer N-30AE promise much, however. Get it out of the box and things remain encouraging. This Pioneer unit is nicely built and looks the part, with its uncluttered fascia featuring a decently sized (but not dominating) display, off-set from the centre, next to the control buttons. Not that you’ll be using these buttons too often, as there’s a comprehensive remote control handset in the box as well. Which, in turn, you probably won’t be using too often, on account of the Pioneer control app that you’ll more likely default to using on your smartphone or tablet. Also in the box, alongside the remote and batteries, are the power cable and a standard pair of analogue interconnects, to link the unit to your stereo amplifier. The Pioneer N-30AE will drag the digital music files (low and high-resolution) from your computer or NAS drive and drive them to your speakers via your amplifier. It has an ethernet input for hard-wiring into your network, and twin aerials for a wireless connection. Take note, though, that for hi-res files with sampling rates of more than 88.2kHz (the N-30AE will play files of up to 24-bit/192kHz), or for DSD files, you will need to use the wired connection, not wi-fi. Either method of connecting to your network will work just fine for everything else though. The N-30AE will seek out internet radio stations via TuneIn Radio, play tunes from Spotify, Tidal and Deezer, take files directly from a USB stick or hard drive connected by USB, and take a signal from your iOS device via AirPlay. This Pioneer has got plenty of bases covered then – and as far as features go is the equal of the Arcam. Indeed, that little screen on the front puts it at an advantage, it’s handy to have album art on display, along with other information of what’s being played. The rPlay, in contrast, gives little away from its pretty much blank face – relying on its sonic abilities rather than any obvious visual distractions. We get everything set up on the N-30AE without mishap – although it’s a shame that this, as with so many pieces of kit we see nowadays, comes with only the most rudimentary of quick set-up leaflets in the box. You’ll need to go online to download the full manual, should you require it. Still, there are no problems in setting up, so the leaflet steered us well enough. Directing the Pioneer to play a tune is a fairly logical, simple process. It takes a bit of time to find your way around the remote handset – as we say, it’s quite comprehensive – but it’s certainly not a taxing process. And in no time we are playing CD quality tracks from our Naim server. We follow these up with a switch to the NAS drive that houses our DSD files, and the Pioneer doesn’t falter, finding tracks without fuss. Likewise internet radio and tracks streamed from Spotify, both via Spotify Connect and the app on the streamer itself. It’s all fairly impressive for what is a relatively low-cost streamer, in the big scheme of such things. But how does it sound? Of course, as the keen-eyed reader will have guessed from the star-rating at the top of this review, it’s here that the Pioneer simply cannot keep pace with its most obvious rival, the rPlay. It just sounds a bit flat. No matter what the format played, the Pioneer lacks dynamism. In Habanera from Bizet’s Carmen, the pulsing rhythm of the strings fails to grab the attention in the way it should. There’s no precision to the sound, and it’s sometimes a strain to pick out individual instruments. There’s no obvious bias to one part of the sonic spectrum, so the overall sound is at least nicely neutral. However, that means both bass and treble notes fail to grab the attention. There’s no real crispness to the start or finish of notes and the overall sound, while perfectly listenable, is uninspiring. The lack of power to bass notes means the music sits in the background, as opposed to getting our toes tapping in a proper listening session. In fact, that sums up the N-30AE: it’s a perfectly competent device for finding and delivering music for background entertainment, but if you want to sit down and really listen, you can’t help but feel there should be quite a bit more to its performance. 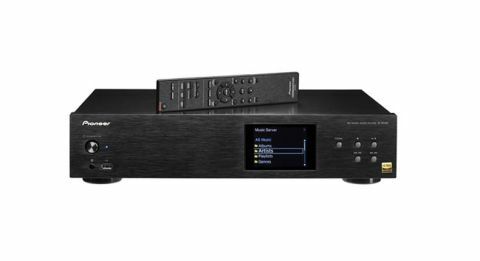 Inevitably, we use the Arcam rPlay to stack up against the Pioneer for comparison, and the same piece, Habanero, from the same NAS device, suddenly springs effortlessly to life. The Pioneer’s somewhat lacklustre sonic character is consistent, no matter the source or file used. Hi-res files inevitably bring more to the table, but that’s down to the format rather than the streamer bringing the track to our attention. That it is solid, reasonably simple to use and has most of the features one could want in such a unit are all big plusses for the N-30AE. But we find it hard to recommend the Pioneer N-30AE as a piece of hi-fi to sit down and pay attention to. It fails to bring much spark or life to any of the music we ask it to play. No amount of features or ease of use can make up for that.